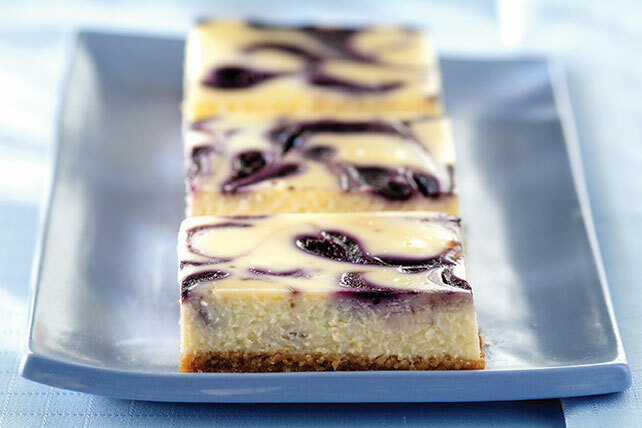 Use fresh or frozen berries to make creamy Blueberry Swirl Cheesecake. Either way, Blueberry Swirl Cheesecake is sure to get you a load of compliments. Line 13x9-inch pan with foil, with ends of foil extending over sides of pan. Mix crumbs, 3 Tbsp. sugar and butter; press onto bottom of prepared pan. Bake 10 min. Bake 45 min. or until center is almost set. Cool. Refrigerate 4 hours. Use foil handles to lift cheesecake from pan before cutting to serve. Enjoy a serving of this delicious cheesecake on special occasions. Substitute 1 can (15 oz.) blueberries, well drained, for the 2 cups fresh or frozen blueberries. Instead of using a blender, crush the blueberries in a bowl with a fork. Drain before spooning over the cheesecake batter and swirling as directed.